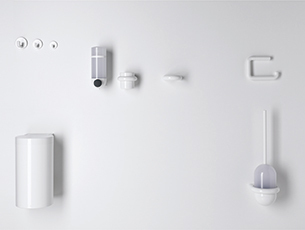 Especially for areas with the highest hygiene requirements, HEWI has developed products with an anti-microbial effect. The products provide effective protection against bacterial contamination. This is achieved by using microsilver, which is broadly effective against bacteria and fungi. It discharges silver ions, which inhibit the growth of bacteria and other unwanted germs, and so minimise the risk of infection for humans. Within 24 h, any unwanted germs on the surface of the products are continuously reduced, so that 99.9% of all germs are reduced within this period. The integrated antimicrobial protection of HEWI active+ supports hygiene effectively. The microsilver is uniformly incorporated in the polyamide during production. This firmly bonds the additive with the product and makes it insensitive to UV light and cleaning methods. Due to the porous surface of the microsilver the material used has an excellent depot effect, which following incorporation in the polyamide has a lasting, reliable effect. HEWI active+ impacts neither the environment nor the human organism. The active substance is ECO CERT certified and is suitable for use with skin care products. 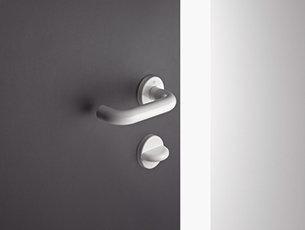 A comprehensive range of lever door handles, sanitary accessories and care products are available in the classic round tubular design in the colour signal white.